Umbrellas are supposed to keep the water out, but those $5 throwaway models will soak through in a downpour, and even the best umbrellas drip annoyingly when you bring them indoors. Here's a dryer, albeit pricier, alternative. 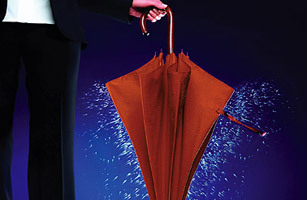 The NanoNuno umbrella dries after a quick shake, so you don't have to park it outside the door on rainy days. The canopy's nanotech polyester surface is designed to repel water droplets, so they don't end up on you or your floor. Its inventors were inspired by the way moisture and dirt roll off the leaves of a lotus plant.